Wed, 24-Apr-2019 - 19:26:38 ---- The fact: 42.844.000 visitors done. Annealing means that the material is heated to a temperature in the range 550-900oC for steels, somewhat higher for stainless steels and somewhat lower for copper alloys, and is kept at this temperature for a certain time and then cooled to room temperature. At these high temperatures there are possible unwanted reactions between the tube surface and the surrounding atmosphere. Oxidation, decarburization and lubricant surface deposits are examples of such unwanted reactions. The selection and control of the furnace atmosphere is crucial for avoiding these negative effects thereby enabling the production of high surface quality with brightness and without decarburization. The long cylindrical shape of a tube means that the proper furnace for tube annealing has to be long. Furnace inlet and exit openings must have heights that let the tubes with the biggest outer diameter pass. A roller hearth furnace see figure 1, is the commonly used furnace type that meets these demands. Figure 1: Schematic cross section of a roller hearth furnace with indication of the atmosphere flow pattern. To minimize disturbances from air entering into the furnace at inlet and exit openings it is required that the height of these openings is restricted to a minimum; just letting the tubes pass through. To avoid oxidation and to eliminate safety risks, air must not enter into the furnace through the inside of the tubes. 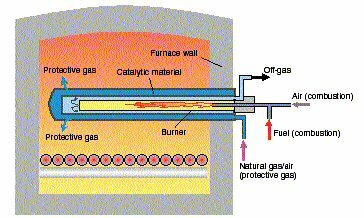 Therefore gas must flow inside the tube in the direction going out of the furnace towards the furnace inlet. This will also assure that lubricants adhered to the tubes are purged away as vapor out of the furnace. The main requirement on the furnace atmosphere is that it should be neutral with respect to the metal. Neutrality implies that the atmosphere composition must be controlled so that there are no net reactions between the tube metal surface and the three elements oxygen (O), to eliminate oxidation, carbon (C), to eliminate decarburization of carbon steels, and nitrogen (N), to eliminate nitrogen pick up in stainless steels. (Hydrogen may have to be regarded in special cases). 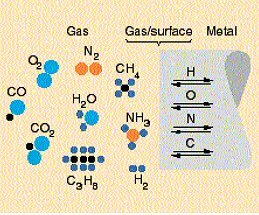 As shown in figure 2 these three elements are present in the furnace atmosphere as the gas molecules oxygen and nitrogen but preferentially as atoms in other molecules like carbon monoxide (CO) water (H2O) or carbon dioxide (CO2). Figure 2. Schematic illustration of the atmosphere/metal interaction. A furnace atmosphere principally has two major parts, a and an active gas. In table 1 the active gas is divided into oxidizing, reducing, carburizing and decarburizing gas components. It should be noted that for stainless steels nitrogen must be regarded as a nitriding and not a neutral gas. In certain, rare cases for steels the risk of hydrogen uptake and consequent hydrogen embrittlement has to be considered. Table 1. Atmosphere constituents and their action. The neutral or inert part (nitrogen) has the function to purge away oxygen or other disturbing gases, to maintain a certain overpressure inside the furnace and to carry the active gas. The active gas has the function to maintain reducing conditions and in the case of steels also to maintain a certain carbon activity. As seen in table 1, the reducing effect from hydrogen (H2) is balanced by the oxidizing effect from water vapor (H2O). The reducing and carburizing effect from carbon monoxide (CO) is in the same way balanced by the oxidizing and decarburizing effect from carbon dioxide (CO2). The atmosphere control accordingly requires a certain balance to be kept between oxidizing and reducing or/and carburizing and decarburizing species. The oxygen partial pressure threshold value, above which oxidation occurs, and below which the metal stays non-oxidized, is well known for each metal, and is expressed by the equilibrium oxygen partial pressure, PO2(eq), of the atmosphere. That pressure is for each metal oxide just a function of temperature and the explicit value is found in chemical handbooks or tables. Quantitative data for these oxygen concentration thresholds values for copper (Cu), iron (Fe) and chromium (Cr) expressed as the equilibrium oxygen partial pressure, as a function of temperature, is shown in figure 3. Chromium is chosen because it is the alloying element in stainless steel that will oxidize most easily. Figure 3. 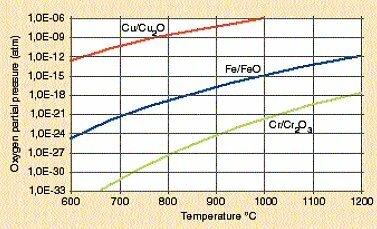 Relation between oxygen partial pressure (atm) and temperature for metal / metal oxide equilibriums for copper (Cu), iron (Fe) and chromium (Cr). These very low oxygen partial pressures are unrealistic as measurable values in the sense that there are no free oxygen molecules to be measured at partial pressure of the order 10-30 atm. However, although there is no free oxygen present, there are substantial and measurable amounts of oxygen bonded in the molecules CO, CO2 and H2O. By measuring and balancing the atmosphere ratios of CO2 / CO or H2O / H2 it is therefore possible to maintain the atmosphere oxygen control. To avoid the formation of iron oxide the oxygen concentration of the furnace atmosphere must be lower than the equilibrium concentration over FeO according to the diagram in figure 3. This equilibrium oxygen pressure and the corresponding ratios for CO2 / CO and H2O / H2, expressed as volume concentrations, are given in table 2 for the temperatures 700, 800 and 900oC. The compositions given in the table are those that should exist inside the furnace, thus after reaction between all incoming gases such as the supplied atmosphere, air entering via leakages and furnace openings and hydrocarbons from rolling lubricants adhered to the tubes. If the steel tubes are going to be used as parts subjected to mechanical load, fatigue or wear, which is the case for tube applications in a car, then there is an additional requirement on the atmosphere to be neutral with respect to carbon. Table 3 gives the theoretically calculated oxygen partial pressure of an atmosphere required not only to produce non-oxidizing conditions with respect to iron but also to maintain carbon neutrality for steels with different carbon concentrations. When comparing table 3 with table 2 it is seen that the required oxygen equilibrium partial pressures for carbon neutrality is lowered by orders of magnitude with increasing carbon concentration in the steel. In other words, to maintain carbon neutrality the reducing power of the atmosphere must increase with increasing carbon content of the steel. Avoiding the formation of chromium oxide when annealing stainless steels will require several orders of magnitude lower oxygen partial pressure than avoiding the formation of iron oxide. This was illustrated in figure 3. Hydrogen based atmospheres therefore must be used. To control the reducing power dew point analysis is the commonly applied method. If an atmosphere containing nitrogen is used it is in some cases necessary to regard the risk of nitrogen pick up in the surface. If the nitrogen concentration is above the solubility limit, meaning that nitrides are precipitated, then a negative effect on corrosion resistance will be obtained. 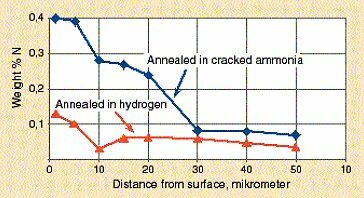 Figure 4 shows that the nitriding effect can be appreciable when annealing is made in cracked ammonia. The degree of nitriding is determined by the atmosphere nitrogen activity, aN, which is proportional to the square root of the atmosphere nitrogen partial pressure, PN2. Although the nitrogen volume share in cracked ammonia is only 0,25, its nitrogen activity is 0,5, thus twice the nitrogen share. Figure 4. Analyzed nitrogen concentration profiles in stainless steel strip after annealing in cracked ammonia and hydrogen atmospheres respectively. Pure copper is a fairly noble metal with high resistance against oxidation. It means that annealing to bright surface can be done in nitrogen containing a low hydrogen concentration (< 5 volume-%). Copper catalyzes the reaction between hydrogen and oxygen to form water vapor, meaning that the hydrogen addition is effective in creating reducing conditions even at low temperature. Nevertheless copper oxidizes easily when in contact with free oxygen. The risk of oxidation is highest in the cooling zone of the furnace due to the risk of air entering from the exit furnace opening. One requirement is therefore to assure that the level of free oxygen in the cooling zone is below a critical value. Brasses and bronzes are more sensitive to oxidation than pure copper. This is because alloying elements like Sn and Zn oxidizes much easier than copper. For bright annealing of alloys like brasses and bronzes strongly reducing atmospheres with high hydrogen concentrations in the range 25-100 volume-% therefore must be used. CARBOFLEXÒ is the name of a family of atmosphere systems with the capability of carbon control. The major atmosphere composition constituents are nitrogen (N2), hydrogen (H2) and carbon monoxide (CO). Figure 5 describes the features of a CARBOFLEXÒ atmosphere system based on the combination of nitrogen and an external endogas generator. Figure 5. 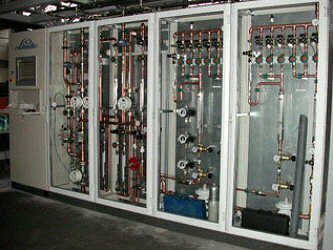 The CARBOFLEXÒ gas system with nitrogen and endogas supply and atmosphere control based on gas analysis. 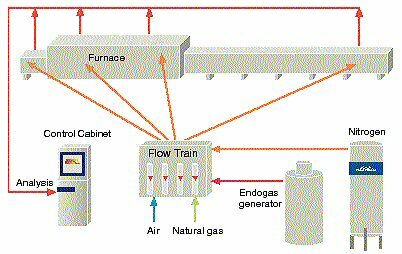 By having two different gas streams, nitrogen and endogas respectively, which can be mixed arbitrarily, flexibility is obtained to properly adjust the atmosphere composition to meet the different requirements, which a tube experiences along the annealing path through the furnace. Specifically the concentration of CO+H2 can be kept high in the hot furnace zone, where the reaction rate is high for both decarburization and carburization, and low at the cold furnace inlet and exit. The CARBOFLEXÒ control cabinet contains a PLC for control and a PC with a touch screen as the man/machine interface, seen to the left in figure 6. All controls such as setting the atmosphere parameters, recipe handling, alarm setting, start up and stop, calibration of analyzers and viewing of actual furnace atmosphere data are made from the PC touch screen on the control unit. With the system historical logged data can be stored, viewed and evaluated for statistical process control. The system can be connected to a central computer supervision system and can be remotely accessible via modem or via Internet. Drastically reduced total gas consumption compared to exogas systems. This is because the flow rate is minimized at any time, based on the atmosphere composition required to maintain the different set points in each moment. External disturbances such as furnace load variations and air leakages are automatically compensated for. Optimized recipes with different flows are at hand to adapt flow and atmosphere composition to tube dimension and tube qualities. Special idling programs are used to minimize gas consumption when there is no production. Process visualization, recipe handling, historical data collection and alarms are appreciated functions. The patented CARBOCATâ equipment, developed by Linde Gas, is an in-situ generator, illustrated in figure 7, in which the endogas is produced directly inside the furnace chamber. Major benefits are: 1)the elimination of a cooling device for the gas, 2) energy savings, 3) floor space reduction and 4) elimination of piping between generator and furnace. Several CARBOCATÒ generators can be installed in the same furnace. HYDROFLEXÒ is the name of a family of atmosphere systems with hydrogen (H2) and nitrogen (N2) as major constituents. A typical HYDROFLEXÒ system set-up for bright annealing of stainless steels is shown in figure 8. If nitrogen pick up is to be avoided a 100% hydrogen system or an argon/hydrogen system should be selected. 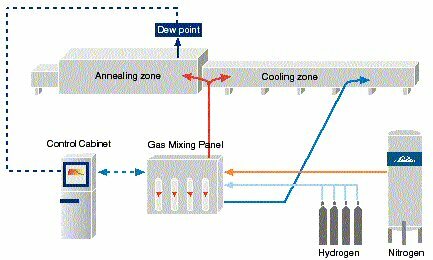 A HYDROFLEX ® nitrogen/hydrogen atmosphere control system for copper annealing has the same principle layout as the one shown in figure 8 but with only 1-2 volume-% hydrogen in the gas mixture and with oxygen control in the cooling zone. The control cabinet for a copper annealing system is shown in figure 9. The flow rate is minimized at any time based on the atmosphere composition required to maintain the different set points in each moment. External disturbances such as furnace load variations and air leakages are automatically compensated for. The atmosphere buffering capability (the ratio H2 / H2O) increases with increased share of hydrogen. Increased buffering capacity leads to that less gas is needed to maintain the atmosphere quality. Nitrogen pick up in stainless steels can be completely eliminated by the use of hydrogen or argon/hydrogen mixtures. A combination of the 1)- and 2)-methods. Table 4 shows an overview of the applications for the different atmosphere production methods. By the notation "A=Applicable", used in the table, is meant practically applicable from both the technical and the economical point of view. When for instance endogas is marked as "Not Applicable" for carbon steels, it is not because it cannot be used, but because it is improper due to safety reasons, the risk of creating soot and for economical reasons. In situ atmosphere generation means that the gases and media are supplied from separate sources and in separate piping to the furnace, where the gases are mixed, reacted and synthesized inside the furnace. This method can be combined with the use of endogas for carbon neutral steel annealing or with cracked ammonia for bright annealing of stainless steel or copper. An alternative route to produce a CO + H2 atmosphere is by cracking of methanol according to the reaction: CH3OH = CO + 2 H2. This is also being done in situ in the furnace. By combining nitrogen with endogas or cracked methanol it is possible to produce almost any N2 / CO / H2 composition, thus also those obtained by endo-, exo- or monogas generators.